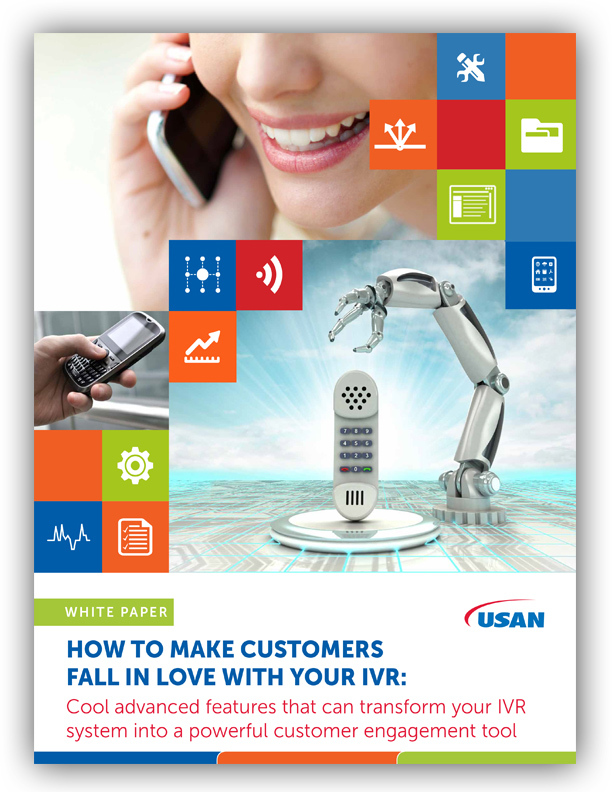 USAN recently published a white paper called How to Make Customers Fall in Love with Your IVR. It’s a spotlight piece, designed to highlight the value of advanced IVR features. I thought I’d spend a few blog posts drilling down a little more deeply into those features. I’m going to start with the way IVR calls start: with ANI—Automated Number Identification. ANI is the shortest path to authentication. The IVR automatically recognizes the caller’s number and instantly asks for the PIN or password. That shaves critical seconds off the authentication process, since it eliminates the step of entering the phone number, listening to the IVR confirm the input, and finally entering the PIN (assuming no input errors). Those few first seconds are critical to the quality of experience your customer will have. Let’s face it, callers are dreading IVR frustration and are eager for a reason to shout “Representative!” It’s annoying to have to enter your account number and then confirm the IVR read back of the number, before you can get down to brass call center tacks. ANI keeps customer databases fresh. Here’s an example. A customer calls to make a payment. The ANI doesn’t recognize the phone number because she’s on her cellphone. The IVR asks for an account number. It’s entered, and matched to the correct account. The IVR can then ask if the customer wants that unknown number added to her account profile. It allows you to instantly route a call to the correct location, department or person. For instance, a national retailer might instantly direct a call to a regional center. Platinum-level bank card customers may be routed directly to an individual—bypassing the IVR entirely. Or an investment client can be connected directly to her broker’s desk without going through an input loop. Companies who do business in multiple languages—English and Spanish come quickly to mind—get great value out of ANI. By recognizing the caller’s number, and connecting it to the profile, you can use the preferred language without asking a caller to oprima dos. Looking ahead, the opportunities to make even greater use of ANI technology are broad. Voice biometrics, for instance, when coupled with ANI can eliminate the entire identity/authenticate input process. Upon answering the call, the IVR simply asks: “Hello Ms. Jones, what is it you need today?” The system analyzes the caller’s voice during her answer (which could be as simple as “account balance”) and instantly authenticates the caller and connects her to the correct place. ANI makes the call authentication process simple, flawless and trouble free: for you, for your customers and—of course—for Mr. Snuggly Wuggles.